Sooner or later, it happens to all of us. Maybe you’re new to the horn and you’ve been using the mouthpiece your band director recommended. No problem there – band directors are pretty sharp. Maybe you inherited your mouthpiece from an older sibling who gave it up. It was good enough for them and, darn it, it’s good enough for you! But eventually, the time comes when you’re ready to choose your own mouthpiece. Exciting, isn’t it? 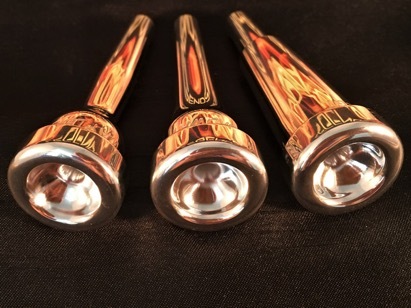 Finding the right mouthpiece will help you improve your tone, range, endurance, and more. But keep this message in mind: the same mouthpiece that helps your buddy sound like Arturo Sandoval doing gymnastics all over the staff, might not work so well for you. Everybody is unique, from skin and teeth to embouchure and playing style, and there is no one-size-fits-all mouthpiece. So, what’s a player to do when it’s time to step up? Don’t worry. Follow these tips and you’ll find your perfect match in no time. When players come into our humble store, their goals are usually pretty broad: I want to play louder, I want to play higher, I want to sound better. Of course, these are noble goals, but understand that a single mouthpiece won’t be able to excel in every way all at once. For example, a small diameter mouthpiece will help you hit high notes, while a larger diameter will be better for volume and low notes. There are many variables involved, and for this reason, it’s important to know what your goals are. With these goals in mind, a brass expert at your local music store will be able to help you find the mouthpiece that will help you achieve them. This one seems obvious, but it deserves to be mentioned – bring your current mouthpiece AND the horn you will be using with you to the store. Bringing your current mouthpiece will allow you to easily compare the new piece you’re trying with the one you’re used to. Without that easy comparison, it’s tough to tell if a new mouthpiece is really more comfortable, flexible, etc. As for bringing your current horn? Without it, you won’t know if the differences you hear in a new mouthpiece are from the mouthpiece itself or from the unfamiliar horn you’re borrowing. Especially if you’ve only ever played with one mouthpiece, it’s important to keep an open mind and experience the variety of mouthpieces available. Like we’ve said before, there is no one-size-fits-all, and you might be surprised how a different cup shape and depth, or rim diameter and contour, will affect your playing. When you’re ready to start trying new mouthpieces, a Ted Brown Music brass expert can walk you through the nitty gritty details. It’s true - there are mouthpieces that will help you play some real screaming high notes. BUT, if you can only play on that mouthpiece for five minutes, it’s probably not the mouthpiece for you. There are times when it’s appropriate to play with a tough mouthpiece, like if you’re intentionally working to improve your endurance, but don’t punish yourself unnecessarily just to be able to squeak out a couple more notes. In the long run, you are better off choosing a mouthpiece that feels comfortable for your embouchure and playing style.